Do You Want Me to Rub Your Tummy? 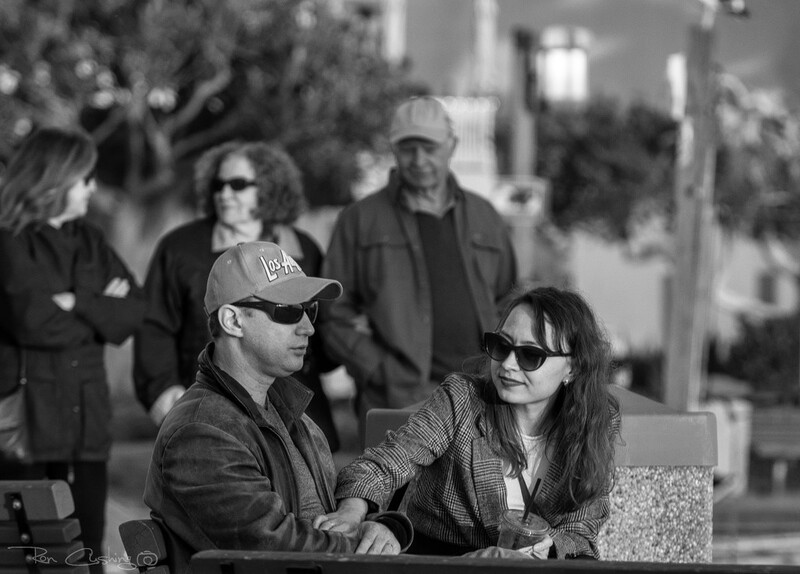 I grabbed this street shot in Laguna Beach where there are always plenty of interesting things going on. I'm not sure what the young lady is doing here, but she seems to exhibit a maternal concern. I get the impression that they're tourists based on the fact that he is sporting a Los Angeles ball cap. You just don't do that if you actually live in the area. Good street capture! You know, some local loyal fans do sport the LA caps. My husband for one. @redy4et Ha ha, sorry, Elizabeth! I didn't really have any sports teams in mind, as this hat appears to be of the non-sporting type. It kind of stuck out like one of those &quot;Newport Beach Life Guard&quot; souvenir shirts - a dead giveaway! @kklinck Thanks Kate, glad I was able to give you a chuckle. @shannejw Thanks Shanne, I do kind of enjoy these shots. @pcoulson Thanks for noticing, Peter. You of course know my love for shallow depth of field. I worked hard to get that focus right - not always easy with a big lens!